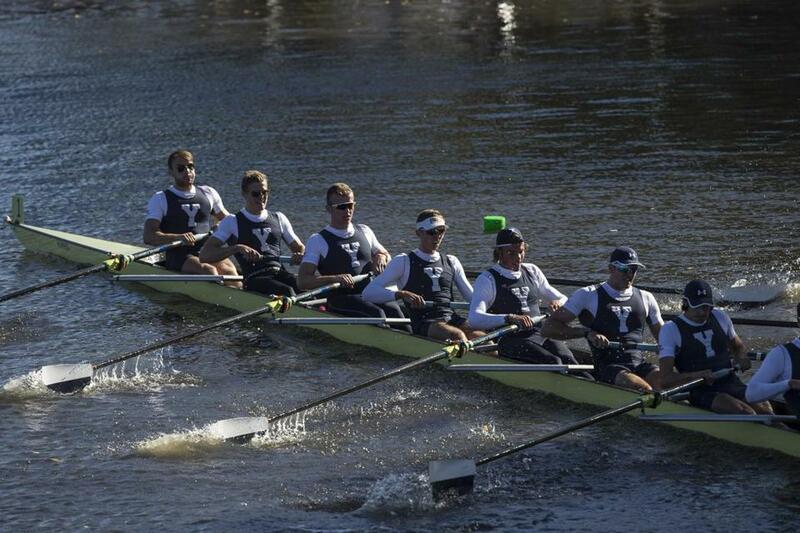 Yale’s men’s eights, the defending champs, settled for fourth place at Sunday’s Head of the Charles Regatta. 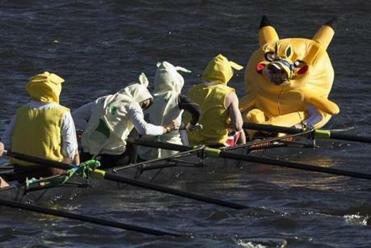 The varsities had their retro race last October, a return to the bygone days when the colleges and clubs ruled the Rivah. This time the bemedaled gods had returned from Olympus, ready to resume their place at the top of the table. Sunday’s men’s championship eights race at the 52nd Head of the Charles Regatta was billed as a showdown between the Great Eight scullers (led by New Zealand’s Mahe Drysdale and Croatia’s Damir Martin), the Rio gold and silver medalists, and the Leander entry that sported half of Great Britain’s gold-medal eight and was headed by the stroke of their championship four. Somehow that script never reached Seattle, the place that produced the “Boys in the Boat,” who became Olympic deities themselves eight decades ago. On a blustery afternoon with a stiff headwind, the University of Washington turned the form sheet upside down, blowing away the field by a dozen seconds to claim its fourth title. “We definitely thought we went under the radar,” said coxswain Stuart Sim after the Huskies finished in 14 minutes, 40.823 seconds, leading a finishing parade of six college entries with California, Harvard, defending champion Yale, Boston University, and Princeton. In their wake was the Great Eight (racing under the West End RC ensign), which finished more than a half-minute behind the winners as Leander slogged in 13th, 50 seconds off the pace. Freshness quite likely was a factor for the Great Eight, most of whom had raced in either Saturday’s championship singles or doubles. And motivation might well have been an issue for Leander, whose oarsmen had little to prove here after their gilded week in Brazil. Neither fatigue nor incentive was an issue for the women’s Great Eight, the global all-star scullers rowing as the Cambridge Boat Club, who dunked their “Super Sweepers” counterparts from Rio by 15 seconds in 16:30.368, with Yale another second and a half astern. While the Super Sweepers (competing as the New York AC) included the likes of Olympic pairs champion Heather Stanning from Great Britain and New Zealand silver medalists Rebecca Scown and Genevieve Behrent, they weren’t quite up to matching a Great Eight group that featured the Rio gold and silver medalists in Australia’s Kim Brennan and Stone, plus former Olympic champion Mirka Knapkova of the Czech Republic and former world titlist Emma Twigg of New Zealand. Washington, which had won the men’s crown in the previous two Olympic years as well as in 2010, came here both revved and resolute. Last year’s fourth-place finishes both here and at the IRA national championships, where archrival Cal ended the Huskies’ five-year reign, was bitter medicine. So they came back to the boathouse earlier than ever this summer and began practicing on Sundays. And when they took the line downriver Sunday, the oarsmen weren’t wearing their signature shirts with the big purple W.
Spectators watch as a crew rows under the Elliot Bridge. On a gusty, swirly day when the headwind made every turn a challenge, Sim prudently worked off the coxswains of the two Olympic boats just ahead to gauge the most effective line, then passed Leander and kept motoring. Yale, which started first after winning last year, didn’t have that advantage and had a rough trip. 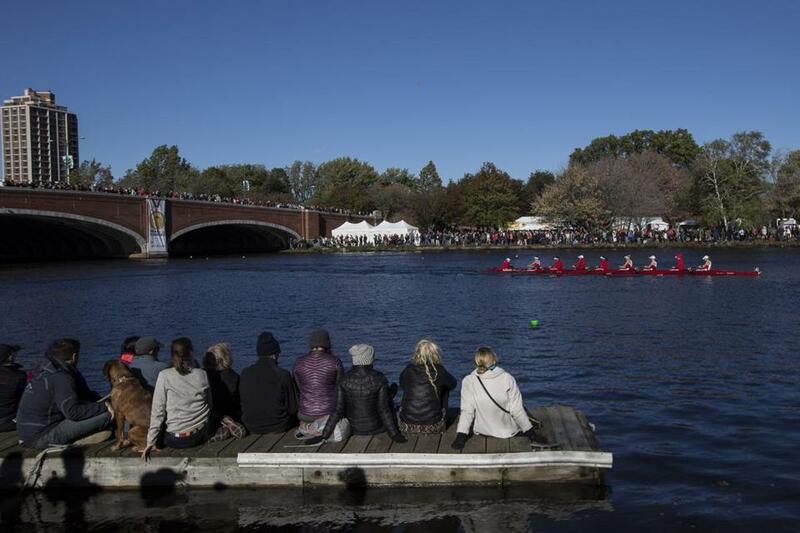 Coming out of Dead Man’s Curve into the final straightaway, the Bulldogs had a major steering mishap, missed the Eliot Bridge’s center arch and essentially had to return to the middle of the course via Watertown Square. Had Washington made up enough ground to win? “Honestly, at the finish line I was thinking we came second because I saw the gap of the boat ahead and thought, that’s pretty big,” Sim said. The clock — and recent history — declared otherwise. If it’s an Olympic year, it’s U-Dub’s day.